From bright avocado-mango to juicy fig, these 11 amazing salads take advantage of summer's freshest fruit. This terrific summer salad is the perfect balance of sweet and savory. Fresh strawberries in this delicious salad make it great to pair with a bright, berry-scented rosé. Juicy Black Mission figs and a spicy, lemony vinaigrette star in this fast, vegetarian salad. Top Chef alum Stephanie Izard's healthy salad features kohlrabi, which tastes like a milder, sweeter and crisper version of broccoli stem. Spicy gochugaru (Korean red chile powder) adds fantastic heat to this refreshing watermelon salad. Strawberries, cilantro and toasted pumpkin seeds give this traditional Tuscan salad a California spin. 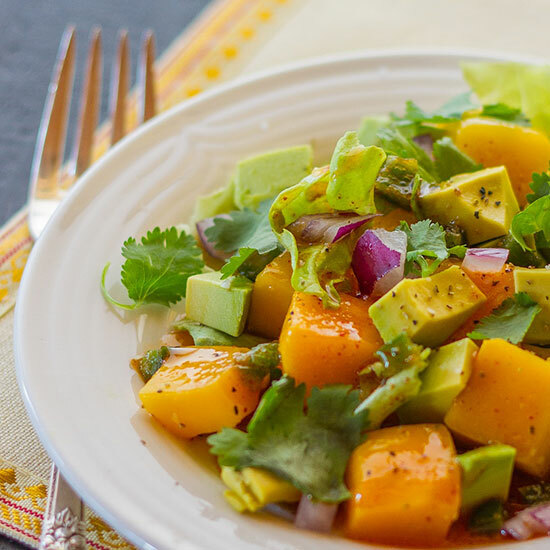 This Mexican-inspired mango and avocado salad comes together in just 20 minutes, making it perfect for a summery weeknight meal. Make this easy, fruit-filled salad with blackberries and whatever melon looks best at the market. "I think shellfish benefits from a little sweetness," says F&W chef in residence Grant Achatz. This healthy salad combines juicy baked beets, fresh raspberries and avocado. Top Chef host Padma Lakshmi likes using yuzu (a sour Asian citrus fruit) in the vinaigrette for this simple salad.